Export Outlook Express DBX to PST, MBOX, EML, & MSG file. Preview Outlook Express emails in multiple styles along with attachments. Migrate DBX to Outlook PST in batch & keep the folder structure as it is. Scan and save selective Inbox.dbx files/folders with individual status. Auto load files for conversion by locating their storage folder. Option to break PST by size while migrating DBX to Outlook. Once after exporting data, one can import Inbox.dbx to Outlook PST. Outlook is not mandatory to migrate DBX files to Outlook file. With the release of MS Outlook 2010 email client had brought fantastic features for emailing and contact management that most of the Outlook Express users switched to MS Outlook. To switch into Outlook 2010, user don’t need to carry out unnecessary mailbox information and thus they only wish to import inbox.dbx to Outlook 2007. Here we will discuss few drawbacks of DBX files which are also responsible for DBX to PST migration and the key features of DBX converter tool. Let us start with the brief features of DBX to Outlook migration tool which are as described as below. Batch Export DBX to Outlook: After the software loads multiple DBX files, it starts scanning process. Once after scan is finished, you can export as many Outlook express DBX to PST file. Each single PST file will be associated to single DBX file. It means if you have exported inbox.dbx then a separate inbox.pst file will be created and similarly outbox.pst for outbox.dbx, sent.pst for sent.dbx and so on. Import Inbox.dbx to PST & MSG: MS Outlook has now become one of the most popular email client so by keeping this in mind, the tool allow to save DBX to Outlook PST file to access Inbox.dbx data in Outlook and MSG file for accessing individual Outlook message. Migrate Inbox.dbx to MBOX & EML: To fetch Outlook express emails and contacts to other email clients and platforms like Thunderbird, Windows Live Mail, Outlook for Mac, the software enables users to export Inbox.dbx to Thunderbird EML and Mac Outlook MBOX. Attachments Preview: Once the DBX converter software loads emails in its user interface while performing migration, it also provides a preview of all attachments available in that emails. 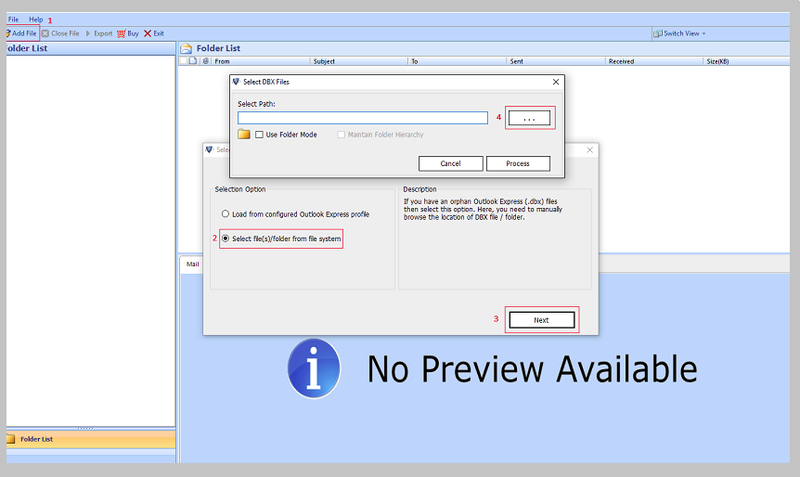 Export Migrated File to New folder: While migrating DBX to Outlook PST, MSG, EML or MBOX file, the software gives an option to save the file in the software panel itself. Auto Browse Storage Location: This option will be helpful if someone has forgotten the file storage location. To take the advantage of this feature, user have to check-mark the box to enable “Auto Detect” option and after doing this, the tool will itself detect the location of the file to be migrated. Naming Conventions: Inbox.dbx to Outlook migration tool allows to use multiple naming conventions while migrating emails only. With this feature, you can save the file by providing these elements: date, subject, address, company name, etc. Quick Scan Report: After adding file in the software interface, it starts to scan them appropriately and once the scan has finished, the tool generate a brief report of scan operation including the items count of each folder in DBX file. The demo edition of the software will preview and let you export 25 items per folder from DBX to PST, MBOX, EML, and MSG file format. The full edition of DBX converter tool will unlock all the restriction in the Demo version and let you import multiple DBX file of any size to different email clients. Could we perform batch migration of DBX file to Outlook PST? Yes, you can migrate DBX files in a group, all you need to do is to create a folder, select the desired amount of DBX files and proceed to the further steps. Which email clients and platforms will support the file format after conversion using DBX to MBOX migration tool? It depends on the file that you have migrated from DBX file. Practically the converted file can be accessed by the email clients which supports EML, MBOX, PST and MSG format such as Windows mail, Outlook for Mac, Thunderbird, Windows Live Mail and so on. How can this software be helpful to open inaccessible DBX file? Using this tool and by exporting DBX file to PST, you can migrate data from inaccessible DBX to PST and sync them in MS Outlook easily. Can I repair multiple PST files & folders all at once? Yes, the software enables the user to repair PST file in batch. It means you don’t need to wait until repairing of one PST file to complete. Copyright © 2019 | All Rights are Reserved.